Bedtime Story print reminds me of the book "Goodnight Moon" by Margaret Wise Brown. Beautiful detail on all of the Blueberry prints. Wisely sewn with room at the bottom that is one piece of fabric so that there is no bottom seam so no wicking. More wet bag prints to choose from! 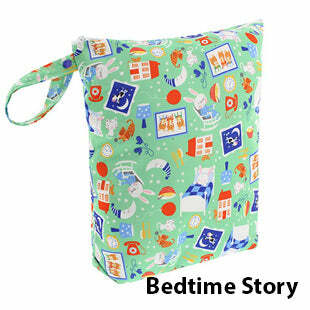 Stylish wet bags from Blueberry. 16x14x4, zipper closure. The others are flat but this has a 4" gusset on the bottom. The gusset is very nice. It helps them stand up and it makes them bigger inside and a little easier to use and empty out. Made in USA high quality. Did I mention these are made in the USA? Yes, I did. I value that fact and I know they are high quality. What is a wet bag? The wet or soiled diapers and cotton wipes go into this before you zip it up and put it in your diaper bag so that the diaper bag stays clean. Then you wash it just like you wash your diaper covers. It's made of diaper cover material which is polyester with polyurethane laminate for waterproofing. It doesn't mean the bag is wet. It means the wet stuff goes inside the bag to keep the dampness contained. I also use these for travel for toiletries and for many other uses. 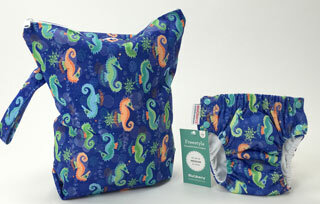 It is a funny name because a "wet bag" is used to keep your diaper bag dry! But it makes sense if you think of it as a place to put the wet things. This is my favorite wet bag that I’ve bought. 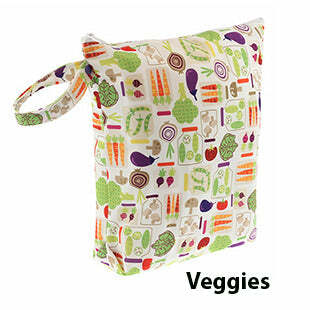 It’s the perfect size to carry with me in the stroller or diaper bag when we are having a day out. Wish I had discovered this one as my first one and only had this to chose from. I bought a planet wise wet bag and a blueberry wet bag. I bought a planet wise wet bag and a blueberry wet bag. I prefer the planet wise PUL, however the blueberry wet bag has a faster drying time. This is a good product. The only problem I have with it is that it doesn't fully seal in the smell. This bag is pretty good, but because of the way it is sewn, does not zip completely closed. This bag is pretty good, but because of the way it is sewn, does not zip completely closed. There is a quarter-inch gap at the top, which is disappointing. I will have make sure this bag is sitting completely vertically so it doesn't leak. I also bought a Thirsties wet bag which I like much more as it zips completely closed. The Thirsties bag also has the loop that snaps open and shut to tie around another item and hang, whereas this one is sewn shut and not super useful. If I had to do it again, I would purchase two Thirsties wet bags instead of one Thirsties and one Blueberry.